A healthy, hearty, lemon-ey salad from the cookbook Blissful Basil. Vegan and gluten free. Oh hi – long time no post. Last week, I was a bit sick and down for the count, to say the least. This week, I’m on a healing bender. I have my blender working overtime with crazy green smoothies made with ginger, turmeric and every herb that I’ve read about that contains immune-building qualities. I’m trying to eat lighter and brighter as well because I really do believe that plants can heal. Which brings me to this recipe from Blissful Basil, a cookbook that couldn’t have arrived at a better time. If you don’t follow Ashley’s blog of the same name, you must! She has the most gorgeous recipes that you can feel great about eating. In her book, she shares her story about dealing with anxiety as well as other health issues, and how she came to learn that a plant-based diet was just the thing that made her health thrive. The book is filled with 100 creative veggie recipes like Sloppy Shiitakes (her veggie take on a sloppy Joe), Triple Noodle Power Pad Thai, Vegan Snickerdoodle Cookie Bars, to name a few. (I’ve bookmarked practically the whole book). But today’s recipe is this simple, delightful, hearty, lemon-y salad that I just love. Despite its name, buckwheat is actually a gluten-free grain. I had never cooked with buckwheat groats and I have to tell you that I’m obsessed. They take only about 10 minutes to make and they’re similar in texture to farro or wheatberries. The hearty, chewy bite is just so wonderful in this salad. This recipe makes for either a great packable lunch or a delicious dinner, if you just add whatever protein you like served on the side. Or click here to get your copy right now! This recipe is from the Blissful Basilcookbook and is reprinted with permission from the publisher. Add the buckwheat groats to a fine-mesh strainer and thoroughly rinse with cold water. Un a medium saucepan, combine the rinsed buckwheat and water. Bring to a boil, decrease the heat, and simmer, uncovered, for 10 minutes, or until tender, stirring occasionally to prevent burning. Stain and rinse with cold water until the water runs clear. Transfer the cooked buckwheat to a large nonreactive serving bowl along with the apple, greens, cranberries, and pepitas. 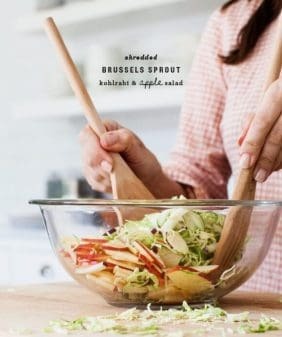 Make the dressing: In a small bowl, vigorously whisk together 3 tablespoons of the lemon juice, olive oil, maple syrup, Dijon mustard, garlic, sea salt, and black pepper to taste. To assemble: Pour the vinaigrette over the salad and toss to coat. If desired, add the remaining 2 tablespoons lemon juice to the salad to brighten the flavors, and liberally season with salt and pepper. 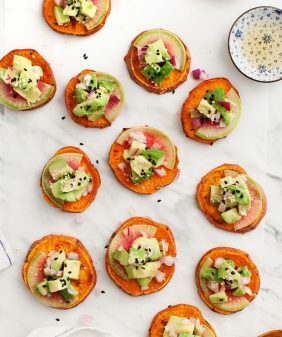 Divide among plates and top with the sliced avocado. I love your love and lemons cookbook. This one looks amazing as well. I just purchased the ingredients for this salad & will be making it for dinner. Your recipes are delicious, and Blissful Basil’s cookbook looks amazing too! I would love to be considered for the giveaway. So delicious and refreshing!! Had a lime on hand which I subbed for the lemon, yum! Thanks for sharing this recipe, can’t wait to use this book! This recipe and the tamale one you mentioned sound so good! Can’t wait to try them out. I recently made a smoothie from her blog that was really good. I would love to have a copy of her new book! I would love to win! Thank you! the cookbook looks so nice. I think this the perfect January dinner. Imag make it tonight! Try again: I think this is the perfect January dinner. I may make it tonight – right after a typing or proofreading lesson. Love the people who are so creative and healthy that generously pass on their knowledge and recipes to us. Thank all of you! Your correction totally made me chuckle! Wonderful salad from a wonderful cookbook! Sounds yummy – this will be on my rotation this week – thanks! Can’t wait to try this recipe. Looks like a gorgeous cookbook! I’d love to try this recipe and the others in it! So simple and quick. Can’t wait to try this! Some of my favorite ingredients, all in one dish. Trying this today! 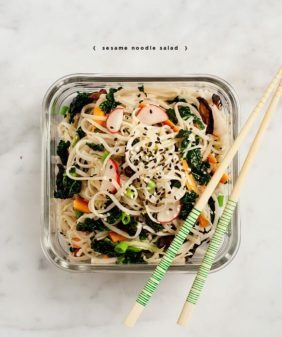 I love the Blissful Basil blog and her cookbook looks even more gorgeous! Looks like a wonderful recipe and cookbook. Since I do not have buckwheat on hand and I am home ill, I will try substituting my favorite grain of Kamut. Thank you. I just love your cookbook and website. My daughter gave it to me last Mother’s Day, my best gift! Can’t wait to try this! Looks great! beautiful! these recipes look delicious. 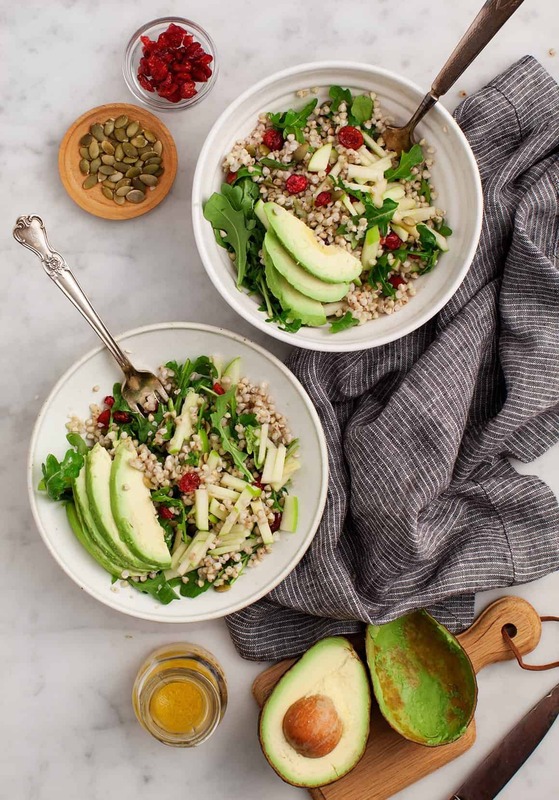 We love buckwheat & this looks like a wonderful salad – can’t wait to try it! Thanks! Would love to try this recipe and add her cookbook to my collection! I just bought buckwheat last week for the very first time! I am so making this salad tonight. I would love to win this to give my daughter for her birthday at the end of January! It would be perfect for her. I’m definitely making this! 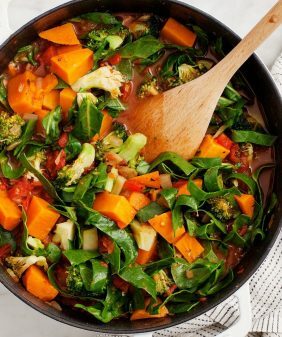 I made your butternut squash chili this weekend and it was amazing – will surely be in regular rotation now! Can’t wait to try cooking buckwheat this way. I’ve cooked it with the lid on and never been really happy with the results. Looking forward to trying this salad, thanks! have you tried rinsing it after it was cooked? It comes out of the pot really gummy, but I was surprised that quick rinse in a strainer took away all of the mushy texture. I would love to win this cookbook. Thanks for doing the giveaway. That’s my kind of salad – lots of fun textures, protein, fiber & big taste – thank you! Last yaear I cooked a lot of your recipes, all great 🙂. This looks so good. It may be a silly question but I don’t have buckwheat at hand, do you think it would work with steel cut oats? Farro or wheat berries would be my second choice if you don’t have a gluten issue. Otherwise, I’d go with quinoa. I don’t think steel cut oats would work in a salad. Hope that helps! also – note that any of those 3 other grains all have to be cooked differently than the instructions listed in the recipe for cooking the buckwheat. Sounds like a great combination of wholesome ingredients. Buckwheat also makes a great healthy “risotto”, add a little nutritional yeast and lemon to the stock. It’s so good! Thank you for sharing this beautiful cookbook and recipe! ooh I’ll have to give that a try – thank you! Looks great! I love farro so will have to try this! I cook almost every single night. We went plant-based October 1st… and need all the inspiration I can get!! I agree the photography and book design is visually pleasing! And all the recipes sound scrumptious! I certainly would be in bliss to win this cookbook! I’m sure I’ll bookmark the whole book too! Looking forward to trying new ingredients and techniques. I LOVE buckwheat groats but have never tried to cook it like this. Will definitely try b/c all of your recipes are simply delicious and healthy. I would love to win this cookbook. It would be sheer blissl! Will pick up some buckwheat groats at Whole Foods later today- this salad looks yummy!! for lunch, dinner, or maybe even for breakfast!! Thanks! This is wonderful! I have a friend who turned to a plant-based diet, and found that her depression improved substantially – she’s vegetarian to this day! Sounds delicious! Will have to try it and would love to win her cookbook! 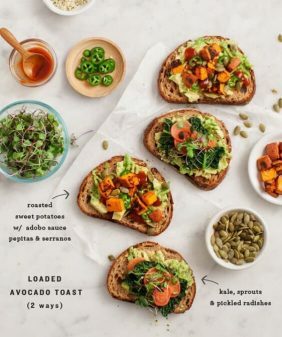 Wow, I literally just received a bag of wheat berries in my weekly veggie box and have been pondering what to do with them…They will work perfectly with this recipe! SO excited to have found your blog. I’m digging deep in the archives and building my healthy eating plan for the year ahead. Thanks for making food so healthy and beautiful. Would love to experiment with her book ! This recipe looks delicious. 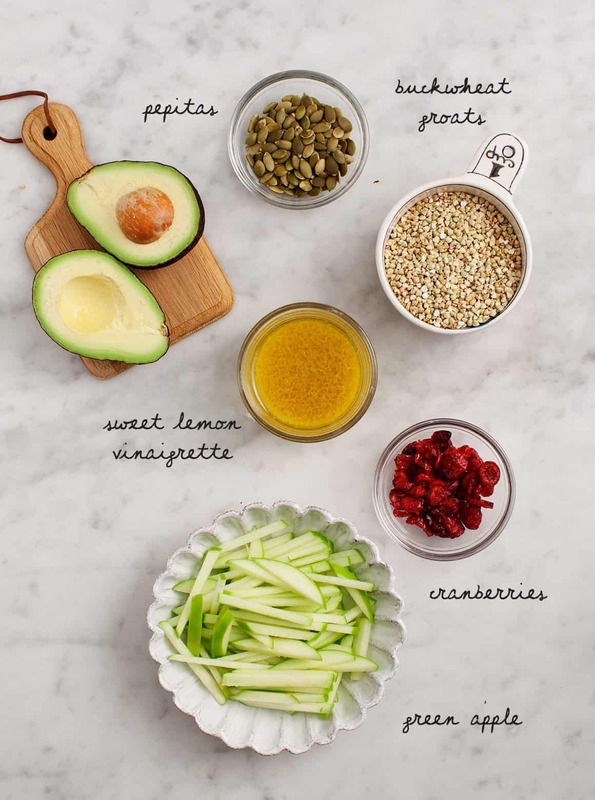 I’m on day 8 of a 10 day green smoothie cleanse and I’m looking forward to making this soon! would LOVE this cookbook to share yummy food with my grad school friends/health care compatriots!! Glad you’re on the mend! Recipe and the cookbook look awesome! Love the using buckwheat groats idea! Thank you both for the recipe and giveway opportunity. Thanks for a great blog, with so many simple and delicious recipes! I love buckwheat but usually add it to rice or make kasha pilaf. I can’t wait to try it in this alas recipe! It looks super yum! Should have said “salad” recipe! Lol! Yummy! Saved this to Evernote, thanks for sharing. This cookbook and recipe looks amazing! I have been on a vegan/plant-based cookbook tear recently, catching up with all the great bloggers that have cookbooks out and I didn’t know about this one yet – thank you! From the bulk section of Whole Foods – will they work ? This recipe looks so good! Would love to check out the rest of the book! Can you tell that I’m sitting here smiling like a total goofball? Because I’m sitting here smiling like a total goofball! Thank you for this lovely review, Jeanine. Means so much. p.s. Hope you’re feeling better—cheers to all the fresh, green, plant-y things! This looks so delicious and bright! Love both her blog and your blog! Would absolutely love the cookbook!!! With so many beautiful and creative plant-powered books hitting the shelves, there has never been a more exciting time to be a vegetable (did I just say that?)! Hope that you’re feeling better! Everything in the cookbook looks so delicious! Can’t wait to give this salad a try! I have all of the ingredients to make this beautiful salad for lunch! Thanks so much for the chance to win the cookbook too! After being plantbased for about 2 years, I’ve found my standard go-to recipes, but I would love a new source for creative meal inspiration when I feel in a rut. This cookbook looks beautiful! This sounds so refreshing and perfect for my winter “blues”! 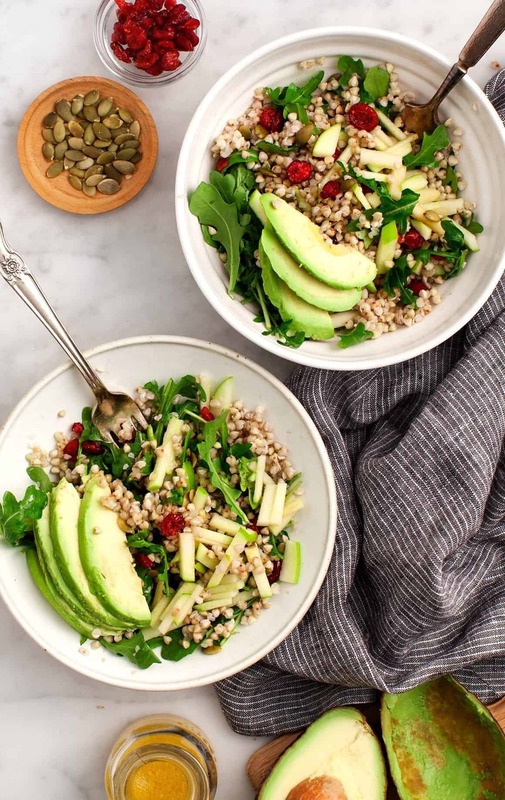 I haven’t worked with buckwheat in ages – this salad looks absolutely delicious. Love all the colors and textures! And those tamales sound amazing. I love buckwheat, but don’t cook with often – simply because I forget how delcious it is. (Thanks for your tip above re. washing away the typical mushiness.) And, this refreshing looking salad looks is an ideal nudge to cook up a batch soon! I’d love to win a copy of Ashley’s cookbook. I would love to win this cookbook! I love cooking (and eating) delicious whole-foods like this. Love and Lemons and Blissful Basil are both blogs I frequent. Thank you! This salad looks amazing! It will definitely be on my “to make” list for next week. Thanks for the opportunity to win such a beautiful cookbook! Many thanks to Ashley for the book. Hope you’re feeling better Jeanine. Both of your blogs are beautiful – truly inspirations! Would love a copy of her cookbook! I just discovered you and love what you’re sharing. This is a beautiful blog! I’m inspired by both of you and would love this cookbook. I love Love and Lemons blog and cookbook and I love Blissful Basil blog and would love to have the cookbook. I’ve been very intrigued by this cookbook! I would love to win it! This looks light and refreshing! Buckwheat is so versatile. I can’t wait to whip up that lemon vinaigrette, too. I would be thrilled to get a copy of this cookbook! Your blog is so inspiring! I would love to get a copy of the book to give plant-based eating (in college) a new outlook. Thank you!!! 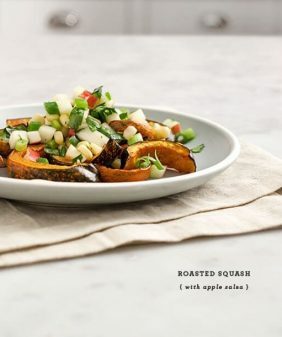 I just found this blog and am excited to try some beautiful new recipes…the cookbook looks great! Never tried buckwheat and would love to try this recipe. Very inspiring cookbook! Thank you for sharing this cookbook and delicious looking recipe. -your book arrived to my door last week and I couldn’t have been more thrilled to open it!! Oh my goodness that salad looks amazing! I really need to update my cookbooks to be more health conscious. good morning! Thank you for the recipe and your incredibly helpful blog. I’m a new mom with a 4 month old, and turning to a plant based diet in the postpartum period for a number of health reasons including PPD. I would love a copy of this book to help get me rolling 🙂 Thank you so much! This salad looks so tasty! I have I only cooked buckwheat a couple times before, but this recipe is good inspiration to do it again. Thanks for the wonderful blog and recommendation. Would love the cookbook! Thanks to both of you to sharing. All the recipes look yummy. I would love to win this book! Being newly married, we are looking for any new vegetable-based cookbooks for our home! Entering for a chance to win with my fingers crossed! Wonderful post! After being sick and eating more veggies, I’m inspired to incorporate more vegan meals into my diet. I would love to have this book to help me cook these meals! This looks so amazing! Thanks for sharing this recipe. I actually just discovered Ashley’s blog as well. I would love to be able to experiment with recipes from her book!! I have your book at home right now 🙂 Thanks!!! I can see that you are putting a lot of efforts into your blog. Keep posting the good work.Some really helpful information in there.Get healthy hints for modifying recipes at blog.kitchology.com. We provide a wide variety of Special Diet tips, reviews and news to enable healthy meal planning.Nice to see your site. Thanks! Looks amazing. Can’t wait to try some of the recipes!! Need to try this recipe! Looks so yummy and I’d LOVE to win this giveaway! I have your love and lemons cookbook, and I think blissfulbasil would be a good addition. Two of my favourite blogs and now cookbooks added to my collection. The first recipe of Ashley’s that hooked me was her super seed pesto. This recipe looks amazing! Would love this cookbook! This recipe looks great! I’m hoping to win but if not I will still be looking for this cookbook. This recipe is on the board for next week. I can’t wait to try it! The recipe looks delicious. Thanks for posting it 🙂 I have already ordered my copy of Ashley’s book but would love another copy to give to my best friend for her birthday at the end of January! This looks amazing!! Would LOVE to dive into this cookbook!! I love the matchstick cut apples – so pretty and delish! I would LOVE to win a copy of this book! I follow both of you and love your recipes. I just made the frittata from your book for brunch this past Sunday. Was delish. This looks delicious and I can’t wait to try it! This cookbook looks as inspirational as Love and Lemons! Looks amazing! I can’t wait to try this! Will try this soon! Just made your millet carrot cakes recipe. Came out beautiful and held together nicely with the flax egg – i added shredded beet for some sweetness and color. Looks amazing. Picked up the ingredients yesterday. Making it today. Would love to have the cookbook. Thanks for sharing. The recipes look right up my alley and the photography is super beautiful! Thanks for hosting the giveaway! What a great giveaway. I’d love to win the cookbook and try some new recipes! This looks fabulous! Your website/blog and cookbook are divine; they invoke happiness! Thank you for this wonderful offer; it would be great to have your new cookbook. Cheers to you!! Looks delicious! Once I get food (story of my life), I’m making this! I’ve cooked buckwheat before, and in both times, the buckwheat gets slimy in the salad. This time, I did rinse after cooking with cold water, but the result seem the same. Any tips or tricks? I did notice the water was all gone by the end of the 10mins, so maybe I’m overcooking the buckwheat? Hmm, once I rinsed mine and tossed it with the dressing, the slimy-ness was all gone. You could try cooking it maybe 2 minutes less (taste to make sure they’re tender) – every stovetop is different. Let me know if you try it again if that does the trick? Thanks, Jeanine! I’ll try again and let you know then. Yes, I know it is probably way too late to win a copy of your book but just thought I had to tell you what a fantastic find it was to run into your blog. I have not tried any of your recipes yet (hey, I just found it today) but was so pleased to find recipes because this is the way I eat. I have never been a meat, potatoes and veggie kind of eater so now you know why I am so excited. The gang at the gym is going to hear all about you too as we exchange recipes almost daily. Thank you again for making my life a little easier and taste better too, I am sure. I love anything lemon so am on my way to the store for the ingredients to make this! Nice. But buckwheat isn’t a grain, although it acts like it. It’s a berry.